Numerous lithographs, engravings and other depictions of the assassination of President Abraham Lincoln came out soon after the event (not to mention in the 149 years since). But the limits of technology of the time meant that no photographs exist of John Wilkes Booth committing the act. (If it happened today, we most likely would have lots of images, from different angles and instances, taken on various portable devices and shared on social media.) The photograph here may be the only one showing someone pointing the actual deringer pistol that Booth used—not something to be recommended from the standpoint of either proper museum collections management or, arguably, good taste. 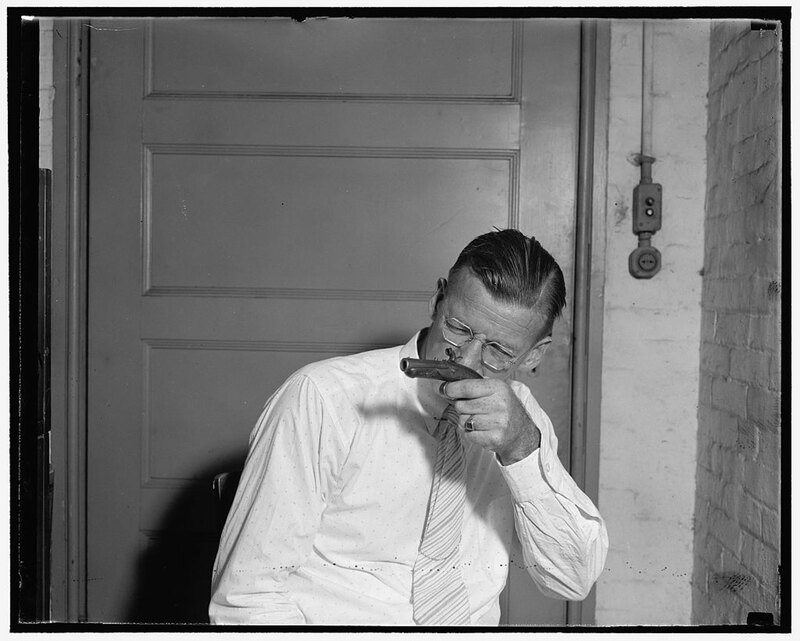 Edwin B. Pitts, Chief Clerk of the Judge Advocate General's Office, holds the gun used by John Wilkes Booth to assassinate President Lincoln. Photo taken on August 10, 1937. Photo courtesy of the Library of Congress, LC-DIG-hec-23179. After Booth fired the fatal shot from his one-shot weapon, he dropped the deringer pistol in the Presidential Box at Ford’s Theatre, struggled with Major Henry Rathbone, and then—jumped onto the stage and fled out the Theatre’s back door into infamy and eventual death. The gun, permanently separated from its owner, then underwent a journey of its own. William T. Kent, a theatre patron who had helped to remove Lincoln to the Petersen House, found the deringer on the floor of the Presidential Box when he returned to look for his lost keys later that night. The federal government kept the pistol as a piece of evidence for the conspirators’ military tribunal in May and June of 1865. Because the Judge Advocate General’s Corps prosecuted the case, it retained the deringer. Eventually the War Department, predecessor to today’s Department of Defense, displayed the deringer at its headquarters. This is how it wound up literally in the hands of the man in the picture: Edwin B. Pitts, the Chief Clerk of the Judge Advocate General’s Corps. Collections management processes in 1937, when the news agency Harris &Ewing snapped this photo, weren’t a stringent or scientific as they are today. Notice that Pitts is not wearing gloves—a big no-no today. Modern museum practice when handling a priceless artifact like this is to always wear gloves, as human skin oils cause deterioration and staining on wood and metal, the materials that compose the deringer. Additionally, one should try to handle an object like this as little as possible, lest one inadvertently cause damage. Three years after the Harris &Ewing photographer snapped this image, the Booth deringer and other pieces of evidence from the 1865 military tribunal joined objects from Osborn Oldroyd’s Lincoln collection, formerly displayed at the Petersen House, in the Ford’s Theatre Museum collection. Today the deringer resides in the Museum—protected in a secure glass case—directly underneath the theatre where Booth fired that one shot. As far as we know, Pitts was the last person to handle the deringer in this way. Or so we hope. Check out more pictures of Pitts with Booth’s deringer, as well as the other evidence in the possession of the Judge Advocate General Corps, courtesy of our friend Dave Taylor of BoothieBarn.com. David McKenzie is Digital Projects Manager at Ford’s Theatre. He is also a part-time History Ph.D. student at George Mason University, studying 19th-century U.S. and Latin American history, as well as digital history. Before coming to Ford’s in October 2013, he worked at the Jewish Historical Society of Greater Washington, The Design Minds, Inc. and the Alamo.